Almond is a deciduous tree. The seed of the fruit from the almond tree has white flower. Almonds are used both as an ingredient and as a garnish in a variety of both savory and sweet dishes. It is used to make candies and decorate cakes. It is mostly used in salads and dishes. The skins of almonds have a great source of vitamin E. Vitamin E contains more number of antioxidants that helps to reduce the ageing processes such as hair loss and wrinkles. It contains more phytochemicals that protects us against cardiovascular disease and cancer. It is a high calorie and high fat snack. Almond oil is rich in vitamin E, proteins, potassium and zinc. There are number of vitamins and minerals which are good for skin, hair and heart. 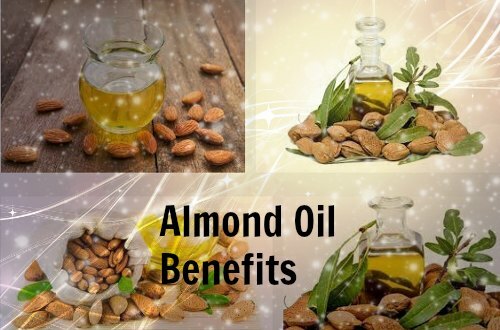 The main focus of the article is to list down the benefits of Almond oil as given below. Almond oil is mild in nature such that, it can be used even on baby skin. It is considered as a good massage oil for young children. If we gently rub the skin with almond oil it gets fully absorbed, making it suitable for after bath. Before applying almond oil warm the oil to body temperature. Many skin care products comes from vitamin E gets added to it. This oil can protect your skin from UV radiation damage, oxidative stress, keeping it smooth and supple. Almond oil deeply penetrates into the skin, softens it and removes the dirt in the skin pores and hair follicles. It prevents ourselves from blackheads and acne. The oil contains vitamin A which reduces acne flare-ups. This oil should be carefully applied on our sensitive skin because it can cause allergic reactions to some people. Dip the cotton into the oil and apply it over the face and remain for 2 minutes then wipe it off with clean cotton. It is an excellent way for removing makeup over the tender eye. Natural scrub facial can be easily done by using almond oil and fine sugar. Mix the almond oil and sugar and apply it over the face and give a circular massage to lift off the grime and dead cells. Wash it with water and repeat it every week for radiant skin. Almond oil helps to remove dark circles under your eye. Take a cotton ball, dip it into the oil and apply it before going to bed then see the result after two weeks. Sunlight can affect the skin and cause redness and pain. Apply almond oil over the patches for fast relief. Sun tan can also be lightened with the oil. Mix one teaspoon of honey, few drops of lemon juice and almond oil and apply the mixture over the patches and gently massage it with fingers and leave it for an hour. Finally wash it with cool water. Bitter almond oil is one of the best way to relieve ourselves from soreness and muscle pains. Massage this almond oil over the tired muscles to feel better. Gently heat the almond oil to the body temperature and apply it over the aching muscles and gently massage it. Take a thick towel and soak it in a warm water, wring it and then cover the massaged area. Leave it for an hour or two hours and this relieves muscle pain. There are hundreds of hair strands we losing every day but it does not affect total hair because new hairs will grow and replaces old hair. If the hair fall is heavier than normal hair fall, our hair becomes thin and less. This is due to environmental pollution, stress and nutritional deficiencies. If there is a deficiency in magnesium and calcium results in poor hair loss and hair growth. This oil consists of minerals. Take almond oil regularly to reduce hair fall. Warm the almond oil and apply it over the scalp and leave it overnight and after that bath. Gently rub the oil over the scalp so that it absorbs and leave it overnight for best results. Take few almonds daily and mix it with almond oil into the salad and have it to make your hair healthy. If there is any insufficiency in minerals the nails become thin and chip off easily. Almond oil is rich in zinc. The deficiency can cause white spots on nails. The oil contains B-complex vitamins and iron which helps to improve nail growth. Heat the almond oil and apply it over the nails and massage the cuticles regularly in order to grow smoother and thicker nails. Almond oil is mild in nature and helps the wounds to heal fast. It helps to get rid of dandruff from the scalp and improves hair growth and reduces hair fall. Massage the almond oil over the throbbing area for faster recovery. It helps to increase brain power and improves memory. Massaging hair with almond oil gives shine and silky hair. Apply a small amount of oil over the eyelashes and eyebrows, which will strengthen and help them to grow. It helps to reduce cholesterol and beneficial for digestive system.